Do you play the piano? If yes, you rock. (I can play by ear b/c Idk how to sight-read–so I guess I semi rock?) 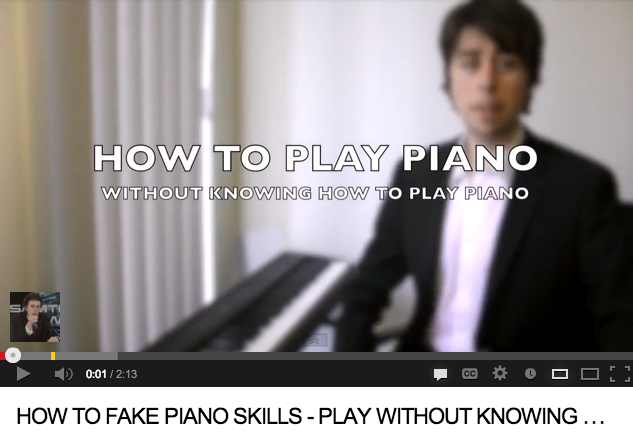 But this post is dedicated to all those of you who DON’T know how to play the piano and frankly don’t care. And because today is Music Monday, why not watch a few other music-related videos?! If you’re like me, you’ll find yourself thinking, “No, I want more! !” (or something along those lines) when this video’s over. Because it unfortunately doesn’t last long enough at. all. NOW ON TO A COUPLE NON-MUSIC THINGIES BECAUSE I CAN, MMKAY? OK I’m done now. (Face it: These were pretty great, huh?) :D Which video did you enjoy the most?? P.S. Giveaway alert!! My blog friend Misfit Librarian is hosting a great giveaway for all “El Chavo” fans! (If you’re not from Latin America or don’t speak Spanish, you won’t know what “El Chavo” means or says.) So go check it out and enter!